Love goes heartbreakingly wrong for this Wyoming cowgirl when her "almost fiancé" dumps her to marry a little redheaded gal he met by chance just a few short weeks ago at the Wild Horse Saloon in Casper, Wyoming. Jane Porter's world spins out of control as she tries to come to terms with the blow that Mike Farley has delivered to her heart by taking another woman as "Mrs. Mike Farley" when Jane has dreamed of that title belonging to her ever since she was a young teenager. When the beautiful Samantha Jo runs away from her hasty marriage to Mike, Jane has a second chance at her dream of becoming Mike's wife. Does she dare give her love a second chance? Find out in Kristie Leigh Maguire's Second Chances: Love Lost, Love Found. 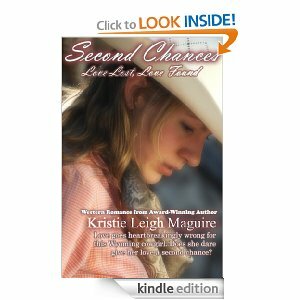 Set in rural Wyoming, Second Chances is a sweet contemporary western romance that will warm your heart.